Openly advertises for writers in print or online publications or both. The publisher claims that it's seeking to publish first-time authors. Openly claims that it's not a vanity or subsidy publisher. Claims that it has a new business model that will bring success, but never explains why successful publishers aren't utilizing it. Claims that the established publishers and published writers are trying to block new writers from being published. It's a long list, followed by a list of properties of a scam literary agent. They also have a list of publishers and other useful links for writers. They also appear to be under legal attack from people who don't like what David Kuzminski, the owner of the site, published. There is a new paper published by S. Sattler, P. Graeff, and S. Willen on the "Fairuse" survey that is investigating why students plagiarize: Explaining the Decision to Plagiarize: An Empirical Test of the Interplay Between Rationality, Norms, and Opportunity (in: Deviant Behavior, 34:6, 444-463, http://dx.doi.org/10.1080/01639625.2012.735909). They interviewed 2806 university students with hopes of determining the rate of plagiarism and gaining some insight into the reasons why student plagiarize and how often plagiarism is discovered. They use Rational Choice Theory to postulate that students weigh costs (doing the research and writing vs. finding something suitable to plagiarize) and benefits (saving time and good grades vs. chance of being caught and the severity of the probable punishment). They measured the frequency of plagiarism by asking the students to self-report having plagiarized in the past 6 months. Over 17 % reported having plagiarized at least once during that time frame. They found that the higher the expected utility derived from plagiarism, the more often students plagiarize. The psychological stress that results from breaking rules (internalized norms) reduces the number of incidents of plagiarism. The more chances there are of plagiarizing, the more plagiarism there is. Students do, however, seem to spend time deliberating about whether to plagiarize or not. increasing the costs and the probability of detection. raising the cost of plagiarism by rescinding credit already earned or suspending students from the course or the university. Universities should have access to professional detection units to take the burden off of the teachers. They also need to communicate a moral condemnation of plagiarism. It's an interesting study (Disclaimer: I read and discussed portions of the paper with the authors) - it remains to be seen if German universities will do anything actively and openly in order to combat plagiarism. The Swiss newspaper Der Bund reports that the University Psychiatric Hospital at the University of Berne has fired a quality manager who had presented herself as having a doctorate in medicine and an honorary professorship from the University of Tuzla in Bosnia-Herzegovina. Even though a medical doctorate was not necessary for the job, having presented fraudulent papers was sufficient grounds for immediate dismissal. The university has announced that it will be pressing charges against her. The comments on this article note that this department seems to be embroiled in a number of other scandals at the moment as well, as well as noting the supreme irony of a quality manager lying about her qualifications. VroniPlag Wiki case #42, is fascinating. It seems that this law thesis was submitted to the Humboldt University in Berlin in 2000. There was so much plagiarism to be found that the submitter was strongly encouraged to withdraw the thesis, which he apparently did. The next year, a new version of the thesis was submitted to the University of Innsbruck in Austria (after all, they do speak German there, too). There it was accepted without question. VroniPlag Wiki has currently documented plagiarism on over 20 % of the pages. One of the major sources is the standard textbook on English law. The other is a thesis on a very similar topic from 1969. Many of the argumentation chains used strangely do not address any of the law commentary or court decisions that took place since then, which is odd for a dissertation prepared at the turn of the century. The author, as is usual, insists that he used footnotes. Of course he did, but it is not made clear that the entire argumentation was lifted with slight changes from the sources. The University of Innsbruck announced that it was looking into legal aspects regarding the Austrian blogger who called attention to the work published on VroniPlag Wiki, not the author of the dissertation, who is currently employed as a professor in Germany. 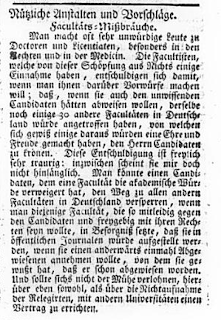 "Man macht oft sehr unwürdige Leute zu Doctoren und Licentiaten, besonders in den Rechten und in der Medicin. Die Facultisten, welche von dieser Schöpfung aus Nichts einige Einnahmen haben, entschuldigen sich damit, wenn man ihnen darüber Vorwürfe machen will; daß, wenn sie auch den unwissenden Candidaten hätten abweisen wollen, derselbe noch einige 30 andere Facultäten in Deutschland würde angetroffen haben, von welchen sich gewiß einige daraus würden eine Ehre und Freude gemacht haben, den Herrn Candidaten zu krönen"
I was sent a link this morning on a portal about plagiarism in Spanish: plagio S.O.S. They appear to collect press information about plagiarism in the Spanish-speaking world. They also have links to many documents about the legal aspects of plagiarism. Currently, three cases seem to be documented in some detail, but my Spanish is not good enough to understand the details. If you read German, have a look at the two letters that the rector of the University Düsseldorf wrote in answer to two of the more distasteful publications about the Schavan case. Ludwig Winnacker used to be the head of the German research funding agency DFG and Kurt Biedenkopf was a politician and president of the private Dresden International University. Both published rather personal attacks in the media (linked from the page) that the rector Michael Piper answers quite elegantly - and just as publicly. In the United States in 2006 it was determined that the book How Opal Mehta Got Kissed, Got Wild, and Got a Life by Kaavya Viswanathan (a student at Harvard), was a plagiarism of Megan McCafferty's books Sloppy Firsts and Second Helpings, among others. The publisher, Little, Brown and Company, recalled all the copies. In Germany in 2010 the book Axolotl Roadkill by Helene Hegemann was published by Ullstein. It was determined to be plagiarism of Strobo by a blogger called Airen. Ullstein purchased the rights to use the texts from Strobo and issued a second edition. The British author Sophie Kinsella is a prolific writer of ChickLit. Her books have been translated into German and are very successful in Germany. A new writer on the ChickLit scene, Martina Gercke, self-published a book Holunderküsschen (Elderberry Kisses) in November 2011 with the Kindle Direct Publishing Programm at Amazon. It was so successful (best-selling eBook for the first half year of 2012) that a publisher "edited" the book and printed it. However, reviews began popping up pointing out uncanny similarities with Kinsella's books. In October 2012 Gercke's second book, Champagnerküsschen (Champagne Kisses) was published at Amazon as a Kindle. In November 2012 a commentator at Amazon gave some concrete details about a plagiarized passage in this second book that were taken from Ildiko von Kürthy's Höhenrausch (Flying High). A massive fight ensued between defenders of Gercke and people accusing her of plagiarism. Gercke apologized in her blog for the "similarities" and promised to "fix" the passages and upload a new version of the book. Self-publishers can apparently change what they upload as often as they like, which makes it hard to discuss a particular version. Kinsella's publisher, Random House, gets wind of the story as the site buchreport (book report) publishes a synopsis of many similarities between Kinsella's books and Gercke's first book. Gercke publishes an apology on her web site along with a video and notes that she has reached a settlement with Random House, and the book will no longer be sold. Unfortunately, both the apology and the video have been removed from her site. In the apology she noted that she was using portions from one of Kinsella's books as "placeholders", something that does not really make sense. Or rather, it doesn't make sense until the more copies from other Kinsella books are documented. buchreport interviews Random House' legal counsel, who is livid about the additional plagiarisms. Being interested in how much more of the books might be plagiarized, I tried to obtain copies in order to run them through some experimental software. The book Holunderküsschen was still on the shelves in the ChickLit asile of the MegaBookStore down the road. But Champagnerküsschen poses a problem: It only exists (apparently also in a number of different versions) on Kindles. Amazon won't sell me a copy. I wrote to a number of people at Amazon, most didn't answer (seems they are all busy fending off a TV report on how badly the company treats their seasonal workers for the Christmas rush). One did answer and suggested I contact the author. I don't suppose she will be happy to help me. I've been able to contact a few people who do have copies, but they are not permitted to lend or sell their copies. They are digitally locked with a DRM scheme to their own Kindle. They cannot be legally extracted. There are no copies on deposit in libraries. This leads to my musings about disappearing texts: How is one supposed to do research on digital artefacts that are not obtainable? I am quite concerned about people removing things from the Internet, pretending they never published something. The Internet Archive is good, but it does not archive everything. Libraries are struggling with eBooks, trying to sort out how to organize lending. Amazon does not really sell copies of eBooks, but just lends them to you for a good price. They are only for you, and if you do something brash like terminate your account because of how they treat their seasonal workers, then all of your eBooks are gone. Let's take this a step further to scientific works. When a researcher leaves an institution, will their homepage with their digital preprints be preserved? When a researcher dies, will there be a digital curator for their published works? Can researchers who are accused of cooking data or plagiarism just remove their works from online and pretend that they mistakenly put up a preliminary version or that it never was published at all? How are we going to deal with this? Paper does have something going for it. You can still find it and read it 100 years later. German chancellor Merkel has now accepted the resignation of a second cabinet member as the result of plagiarism scandals. Both gave a press conference at 14.00 on February 9, 2013 announcing the resignation of Schavan and announcing Prof. Dr. Johanna Wanka as the new minister of education. Schavan pointed out that she is not stepping down on account of plagiarism, as she is still convinced that she did not plagiarize, but because she is suing a university as a private person. She quotes a German politician: First my office, then the party, then me. This, of course, does not solve the plagiarism problem in Germany. I hope that universities now get serious about the problem. The media frenzy around the dissertation of the German education minister has died down for a bit, awaiting her return from a trip to South Africa. Many media have just made clear, that she will have to step down in order to deflect criticism from her office and to give her party a fighting chance in the elections in September. I assume that they are writing their articles about her resignation and looking into possible new candidates. "Ein Engel hat mich reingelegt", ist glaubwürdiger als alles, was Frau Schavan bis jetzt von sich gegeben hat. ("An angel deceived me," is more believable than anything that Ms. Schavan has uttered in this matter). 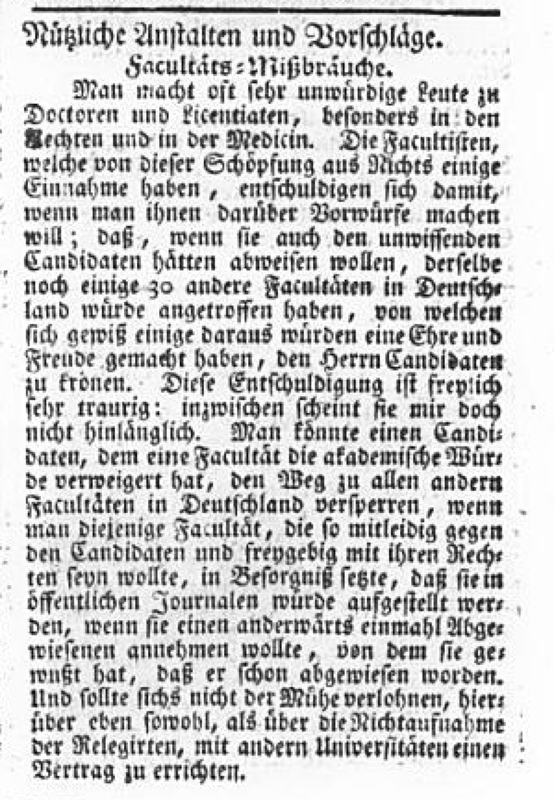 Meanwhile, the University of Lübeck planned to be conferring an honorary doctorate on Schavan in April or May of this year. They insist that they will continue to so so, although there is apparently some dissent. She already has four honorary doctorates. And she is still scheduled to be opening the school education fair in Köln, „didacta“, on February 19. I will be speaking there on February 20 on scientific misconduct in schools and universities. Maybe she will stay on a day, if she is still in office, or I go earlier and we can have a chat? The dean of the Arts and Humanities faculty of the University of Düsseldorf announced on the evening of February 5, 2013, that the faculty board voted 13:2 that the dissertation of Annette Schavan is a plagiarism. They also voted 12:2:1 to rescind her doctorate. There will be a flurry of press reports coming tomorrow, as Schavan is the Minister of Education and Research in Germany. Since her first academic degree was the doctorate, she now only has a high school diploma (Abitur). She can take the university to court within the next four weeks, if she chooses. I will report more on the situation as it develops. The documentation of the plagiarism can be found at schavanplag. Current information from : Tagesschau - Spiegel - Süddeutsche Zeitung. Schavan's lawyers have announced that they will sue the university, according to Süddeutsche Zeitung. The lawyers have published their reasoning for suing. They are mainly stating that information leaked out about the process, and that their suggestion of obtaining a second opinion was not followed [although one could see the schavanplag blog as a first opinion and the university one as a second opinion]. And she had so many pages and footnotes, that bit of plagiarism is not bad and was not intentional. It seems to me that they are not aware of the legal cases on plagiarism that determined just the opposite: Even a bit of plagiarism is not acceptable in a doctorate. This definition nails down some of the nastier corners of attempts to define the term. Common knowledge is something that is not attributable to another identifiable person or source; there are situations where we expect original authorship, even if the use of the text is legally possible because the author had permission; and it covers more that just a word-for-word copy. The paper explores various definitions of plagiarism before focusing on the aspects beyond copyright violation that are important in a university setting.